Sired by Judge & out of LOCKET!!! 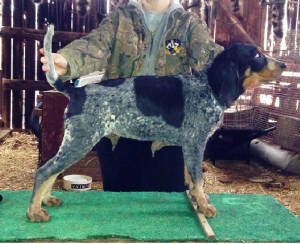 Triple GRNITECH GRCH 'PR' Razor Ridge Pop A Top bred! This is an awesome dual purpose litter!! Update Dec 31, 2014: We may part with one of our pick females from this litter. She is 15 wks old and is going to be fabulous- great color, nice body spots- just an all around nice female. DOT has been bred to JUDGE! See our BLUES page to visit their pages. 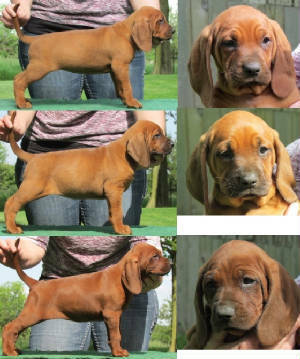 We will be taking deposits on this litter in Jan 2015. From time to time, people tell me, “lighten up, it’s just a dog,” or, “that’s a lot of money for just a dog.” They don’t understand the distance traveled, the time spent, or the costs involved for “just a dog.” Some of my proudest moments have come about with “just a dog.” Many hours have passed and my only company was “just a dog.,” but I did not once feel slighted. Some of my saddest moments have been brought about by “just a dog,” and in those days of darkness, the gentle touch of “just a dog” gave me comfort and reason to overcome the day. If you, too, think it’s “just a dog,” then you will probably understand the phrases like “just a friend,” “just a promise,” or “just a sunrise,” “Just a dog” brings into my life the very essence of friendship, trust and pure unbridled joy. “Just a dog” brings out the compassion and patience that make me a better person. Because of “just a dog,” I will rise early, take long walks and look longingly to the future. CLICK HERE FOR BOOKING INSTRUCTIONS!